At first glance, Notepad2 doesn't have much to distinguish itself from WordPad, the standard Windows notepad. But it offers a number of features that can make it worth the upgrade. 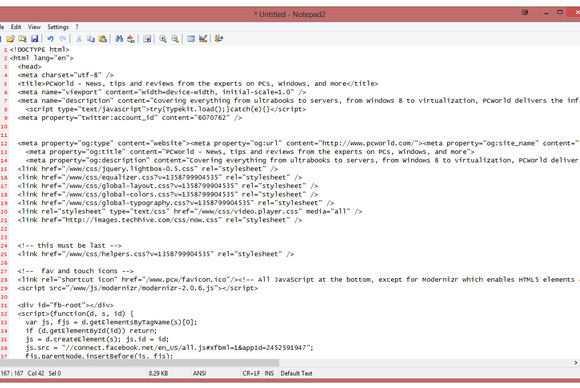 The biggest feature is syntax highlighting. You can have various parts of programming code show up as different colors when code is incorrect, so you can see right away what needs to be fixed. The find-and-replace function really does make WordPad cringe in the corner with embarrassment when you see features here such as match the case, match the whole word and match the beginning of the word only. You can even drag and drop text onto Notepad2, something that regular WordPad definitely won't allow. 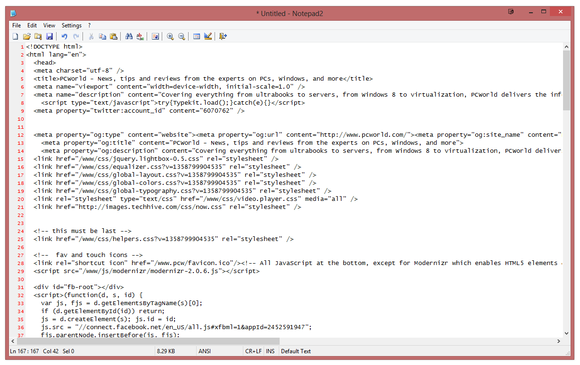 Notepad2 offers syntax highlighting, which makes coding much easier. The one downside to Notepad2 is that it doesn't support tabs, when it comes to opening multiple files. You can open only one file at a time, which is extremely limiting and frustrating. But when you stack that one disadvantage against all the advantages, tabs are something you can live without. Line numbering and syntax highlighting are a few of the features that make this notepad replacement especially attractive to programmers.